To aid with model creation, the main OVP download package includes iGen, a model framework generation system. iGen takes the laborious and error-prone task of constructing the various hardware model and software element files required for a typical model, and automates this process. 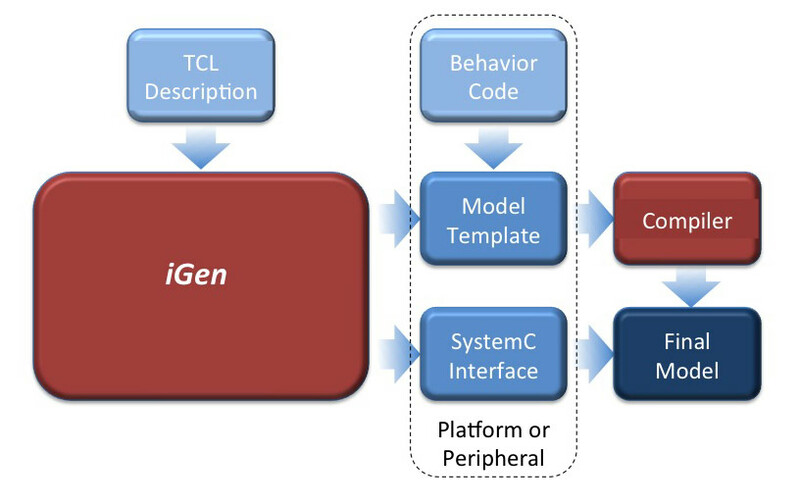 iGen takes as input a simple TCL specification that using a powerful command function set includes device internals such as registers and memories, port information, component descriptors, and other elements. iGen builds three sets of model items, C code model files, user editable templates, and SystemC TLM2 interfaces. These include model frameworks with registers, function calls, memory map, and other items, including matching SystemC information. It ensures that all component parts of the model are well-structured using best practices, and are consistent throughout the files, thus eliminating a common source of errors. iGen presents to the developer a set of function calls and model elements that simply need to be filled in with required behavior, thereby reducing the set up overhead of a new model significantly. iGen also creates code in the model to provide very efficient run time tracing and diagnostics.